Plastic Owl For Pigeon Control - Do Plastic Owls Keep Away Pigeons? Do Plastic Owls Keep Away Pigeons? 06.20.2005 - One of the great jokes of the nuisance wildlife control industry is the use of fake plastic owls for pigeon control. The theory is simple enough. We know that pigeons are terrified of one of their natural predators: owls. Thus, why not use owl decoys to scare away pigeons? Unfortunately, it doesn't work in practice. It might be the equivalent of some nuisance human control operator setting up a fake plastic boogie man (or IRS auditor, mother-in-law, insert scary human here) by your front door in hopes that it'll keep you from entering your own home. It just won't work. You'll know, somehow, that the boogie man isn't the REAL boogie man, but a fake boogie man, and you'll continue to live in your home fearlessly. That's how it is with fake plastic owls. It doesn't work on the pigeons because, surprise, they can tell that it's not the real deal. I know, I know, those plastic owls that they mold are incredibly realistic. So realistic that pigeons usually roost on top of them and poop on their heads. Real owls tend to, you know, move and hoot and swivel their heads and eat Tootsie Pops in three bites. They also eat pigeons in three bites. So when the plastic owl isn't observed eating any pigeons, it tends to diminish the owl fear factor. I've heard of fancier models of fake owls or hawks, complete with mechanical movement and sound effects, but once again, nature isn't easily fooled, and you just can't replicate the real deal. 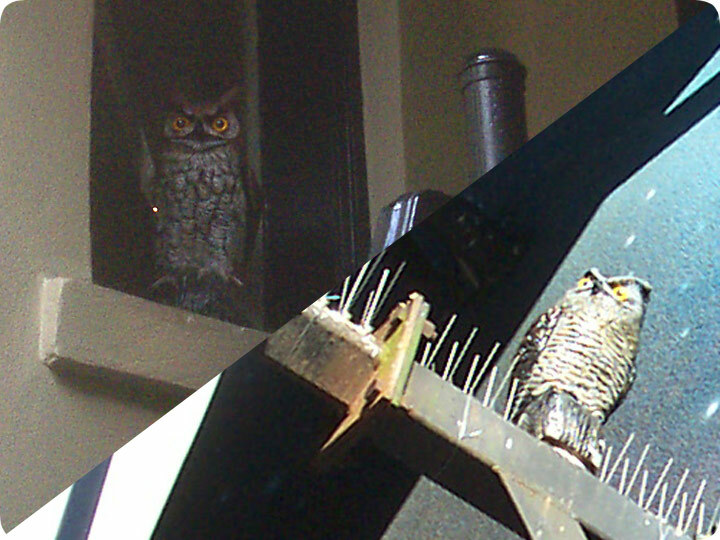 Plastic owls are yet another attempt at cheap and easy wildlife control. Sometimes cheap and easy works. Most of the time it doesn't. In the case of pigeon control, it never does. In fact, many bird control experts will actually seek out plastic owls on buildings and contact the building owners about their pigeon problem, which obviously isn't being solved correctly. The only real way to solve pigeon problems is more complex - usually involving the installation of deterrents that will physically prevent them from landing and roosting - such as bird spikes or netting. In the above photo, we see that the building owners attempted the use of a plastic owl in their first effort at getting rid of the pigeons. Of course it did not work, so that's why I installed these bird spikes on the beams instead. That actually took care of the problem. So go ahead and try out the plastic owl. It might even look cute sitting atop your building, and it might even trick a birdwatcher or two. Unfortunately, it won't trick any resident pigeons, and eventually, you'll end up removing your pigeon-poop-covered bird ornament from the building in favor of a real solution.